Last week on the Eve of New Year 2011, I visited Mount Abu with my two friends to celebrate new dawn of coming year and last dusk of a previous year. 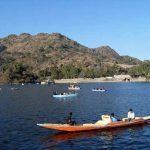 Mount Abu is a pleasant hill retreat amidst the lush forested hills. It is a green oasis in the barren desert state Rajasthan. This captivating hill retreat is the highest peak in the Aravalli Range of Rajasthan state. It is located in Sirohi district South West Rajasthan, 185 Km from Udaipur. We boarded ADI SJ Rajdhani from Delhi on 30th December 2010 and reached the nearest railhead Abu Road Station next morning. From here we hired taxi and reached Mount Abu around 10 am after 2 hours of road journey. After taking refreshment at RTDC Hotel Shikhar, we went outside to explore the charm of this beautiful hill station. The bone chilling wind and freezing weather almost shivered us, but at the same time it also heightens our joy and enthusiasm. 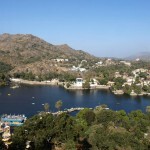 The town of Mount Abu, the only hill station in Rajasthan, is located at an elevation of 1220 meters above sea level. It has been a popular retreat from the heat of Rajasthan and neighboring state Gujarat for centuries. The salubrious climate and array of attractions calls on scores of tourists to this place from several parts of the globe. The hills of this place are known for rich flora covering. The entire hillside includes coniferous trees and flowering shrubs, which heighten the serene and scenic charm of this pristine hill station. Because of its remote location and scenic charm, this place has been home to many sages and saints for many centuries. 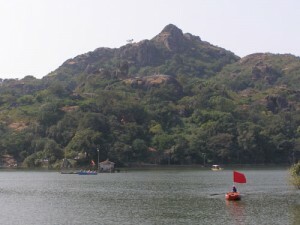 We also experienced the calmness and scenic beauty of this place during our Mount Abu Tourism. It is situated down on the Abu Road side. We took 750 steps down to the valley to reach this place. Small stream flows from the mouth of a marble cow which designated this shrine its name. There is also a marble figure of the bull Nandi, Shiva’s vehicle. The tank here, Agni Kund, is said to be the site of the sacrificial fire made by sage Vashistha, from which four of the great Rajput clans were born. An image of Vashishtha is flanked by the figures of Rama and Krishna. Next we visited Dilwara Jain Temples, which is another most popular attraction of Mount Abu renowned for its exquisite marble carvings. 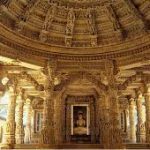 The older temple was built in 1031 by a Gujrati minister named Vimal and dedicated to the first tirthankar (Jain Teacher), Adinath. The central shrine contains an image of Adinath, while around the courtyard; there are 57 identical cells, each with a Budhdha like cross-legged image. The architectural intricacy and delicacy of the marble carving enthrall us most and kept us engaged for longtime. Next we visited the Tejpal Temple dedicated to Neminath, the 22nd Jain tirthankar. For the first time in my life, I have seen such a piece of sculpture. The sculpture at some place was so fine that the marble becomes almost transparent. The lotus at the center of the dome is an incredible piece of work. It is difficult to believe that the huge lacelike filigree made up of solid block of marble. After experiencing the interwoven charm of sculpture and spiritualism we headed towards our next attraction that is Sunset Point. It is the most popular attractions of this place where tourists come in a large number to experience the beauty of setting sun. We also adieu the last sunset of 2010 with a hope that next sunrise will bring lots of fortune for us. After enjoying this place we rushed back to hotels to enjoy New Year’s party. At this electric party, we enjoyed a memorable night which was full of fun, thrill and excitement. After greeting everyone in the midnight, we went to our room and felt asleep.